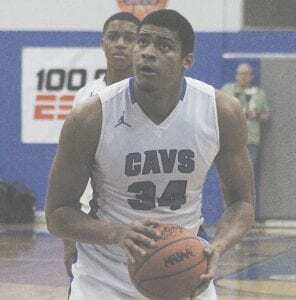 FLINT TWP – The Carman- Ainsworth boys’ basketball team beat Saginaw Valley League-Blue rival Grand Blanc 54-47 last Friday. The victory moved the Cavaliers into a tie with Grand Blanc for first place in the SVLBlue. The win also served as revenge for Carman-Ainsworth’s 56-46 loss to Grand Blanc back on Dec. 14, one of only two blemishes for the Cavs so far this season. Carman-Ainsworth didn’t waste any air, going on a 14-3 run to start the game. An even 12-12 second quarter left the Cavs with a 26-15 advantage heading into the break. The Bobcats clawed back to a 35-28 deficit by the end of the third, but another even quarter at 9-9 gave Carman-Ainsworth the win. Both teams shot nearly even, as Carman-Ainsworth shot 51% from the field compared to Grand Blanc’s 53%. The Cavaliers held a slight 23-18 rebounding edge, while stealing the ball from the Bobcats 12 times. Grand Blanc finished with the turnover advantage, committing five turnovers to the Cavs’ 13. Michael Fletcher posted a double double, finishing with 22 points and 10 rebounds, both game-highs. He also added an assist and two steals. Jayden Nunn scored nine points while pulling down a board and dolling out an assist. Dallas Green added eight points, four steals and two rebounds. Carman Ainsworth was slated to take on Davison on Tuesday night, but the game was rescheduled due to weather. The Cavs, 5-1 in the SVL and 11-2 overall, are at Flint tomorrow for a 7 p.m. tipoff.